To keep your complexion looking healthy, choose from these 6 cocktails. While indulging in more than a few cocktails can take a toll on your skin, drinking in moderation doesn’t have to damage your complexion if you follow these tips to keep your skin vibrant and healthy. The amount you drink, as well as what you add as a mixer, can make a difference in the consequences alcohol can have on your skin. An occasional happy hour or glass of wine with dinner doesn’t have to cause damage to your skin. According the US Department of Health and Human Services and US Department of Agriculture Dietary Guidelines for Americans, moderate drinking is defined for people of legal drinking age as 1 drink per day for women and up to 2 drinks per day for men. A standard drink is the equivalent of 12 ounces of beer, 8 ounces of malt liquor, 5 ounces of wine, or a 1.5 ounce “shot” of 80-proof distilled spirits of liquor (gin, rum, vodka, whiskey, tequila, etc.). Alcohol, whether wine, beer, or hard liquor, has little nutritional value and can contribute to various health problems, from hangovers to reduced immunity and insulin issues, as well as premature aging of skin. When your liver metabolizes alcohol, a byproduct called acetaldehyde is released. Elevated acetaldehyde levels are associated with the adverse effects of excess drinking, from headaches and flushing to nausea and vomiting, as well as dehydration, that leads to wrinkling of the skin. How long does it take alcohol to leave your system? Some people see benefits after avoiding alcohol for as little as 3 days, which gives the liver time to excrete alcohol, sugars, and other ingredients. If you do choose to indulge, following these tips can help minimize the effects of a drink or two. Whether you’re heading to happy hour with friends or enjoying a pre-dinner cocktail at home, knowing what to avoid is as important as knowing what to order. Know your limit. To limit damage from alcohol, women should stick with no more than 1 drink and men no more than 2 drinks. Hold the salt. 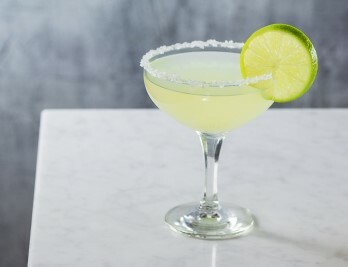 If a margarita is your cocktail of choice, don’t salt the rim. Salt contributes to bloating, causing puffiness. Avoid sugary mixers. Mojitos, tropical fruity drinks, and mixers like soft drinks, juices, or energy drinks cause inflammation, which breaks down collagen and elastin, resulting in a loss of firmness and wrinkles. Don’t order multi-alcohol cocktails. Drinks that contain more than one spirit are higher in alcohol than drinks with just one spirit, which causes more harm to your skin. 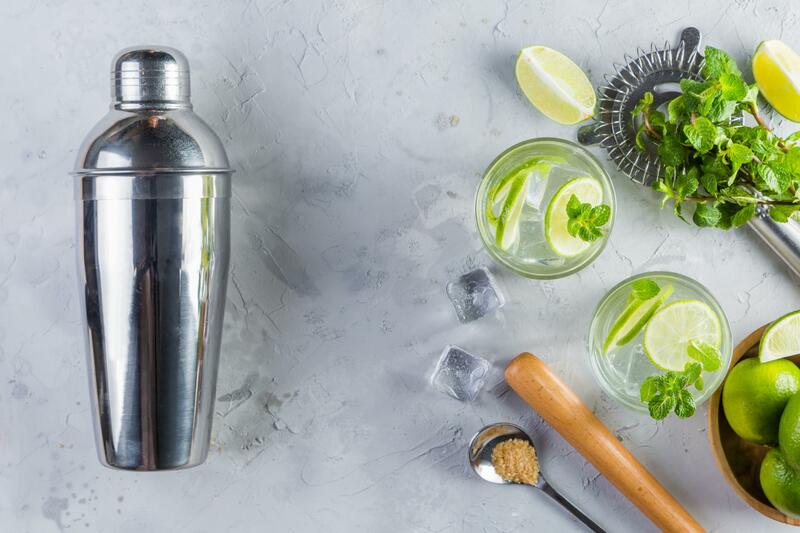 Staying away from salt and sugar can make the occasional drink less harmful to your skin but did you know there are some healthier options for happy hour? The type of spirits you choose is a key factor in limiting damage from alcohol, as is your choice of mixer. However, an occasional drink doesn’t have to harm your complexion if you follow these helpful tips. Go clear. Pick vodka or gin over darker spirits, which contain congeners and byproducts of extra fermentation not found in clear liquor. These chemical compounds make the effects of alcohol more pronounced, including skin damage. Clear spirits also flush from the body more quickly. Muddle. 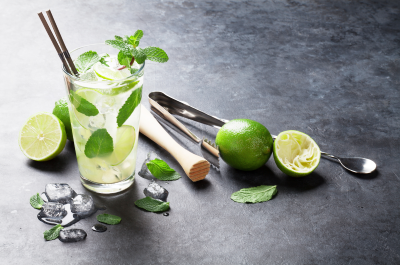 Muddling involves crushing herbs like mint, fruits or cucumbers to release flavors. You do this by pressing the ingredients against the glass with a muddler or the end of a wooden spoon. Not only can you avoid high-sugar mixers but you will also add antioxidants to your cocktail. Hydrate. Remember, alcohol is a diuretic. Hangovers from drinking are the result of dehydration, which also wreaks havoc on your complexion. Drink a glass of water before you head to happy hour and between each drink. Snack on fruits and vegetables when you’re drinking instead of saltier bar foods like fries or chips. Start with a healthy base like 100-percent, no sugar added juice, seltzer or fresh fruit and vegetables. Skip added sugar or salt for a cocktail that provides antioxidants for healthy skin! 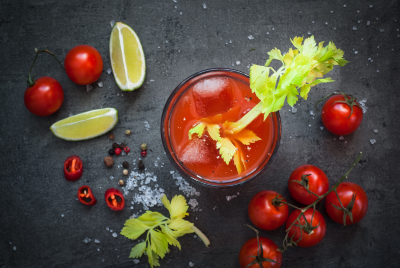 Bloody Mary: Instead of using a high-sodium mix, start with ¾ cup of no-sugar added, low sodium tomato juice. Add the juice of ½ lemon, a dash each of hot sauce and Worcestershire sauce, fresh ground pepper to taste. Top with 1 shot of vodka. Garnish with a lemon wedge and celery stalk. Sea Breeze: Mix 1 shot of vodka with 1 shot of 100 percent juice cranberry juice and 1 shot of fresh-squeezed pink grapefruit juice. Top with a splash of seltzer. Gin & Seltzer: Instead of using sugary tonic water, combine 1 shot gin with 2 shots of seltzer and garnish with a lime wedge. Pear Martini: Muddle ½ of a very ripe pear in the bottom of a cocktail shaker. Add ice, ½ shot fresh-squeezed lemon juice, and 1 shot pear-infused or regular vodka. Strain into a martini glass and garnish with a slice of fresh pear. Melon Mint Granita: Puree 1 cup of seedless watermelon chunks with 5 fresh mint leaves until liquid. Freeze mixture in an ice cube tray. Once frozen, blend with 1 shot white rum until mixture is the consistency of a slushie. Fresh Squeezed Juice-ade: Add 1 shot of vodka to a glass of no-sugar-added green juice. Chill. Enjoying an occasional cocktail doesn’t have to damage your skin if you drink in moderation, limiting your alcoholic beverages to no more than 1 drink per day for women and no more than 2 drinks per day for men. Selecting the right spirits and mixers can also go a long way in limiting skin damage. Make lifestyle choices that limit the harmful effects that lead to premature aging and other skin issues. And complement your choices with Simple Beauty. Our high-performance skin care solutions are designed to enhance skin health with clinically-tested ingredients without hormones or additives.